The MōVI XL 3-Axis Motorized Gimbal Stabilizer Kit with Controller and Cable for Lens Motor is a B&H kit that has been assembled to provide you with a stabilizer suitable for jib arms or other moving supports, a controller with a range up to 600', and a lens motor control cable that powers and controls select lens motors (not included) directly from the gimbal stabilizer. The MōVI XL supports camera packages up to 50 lb and can be mounted on a variety of supports to capture dynamic and exciting moving shots, without the visually jarring shake that all too often accompanies fast-moving footage. The MōVI controller provides you with remote control for panning and tilting the MōVI XL, so you can follow the action and create cinematic camera moves. The FREEFLY MōVI XL 3-Axis Motorized Gimbal Stabilizer supports cameras and accessories weighing up to 50 pounds, so it is designed to be mounted on a remote head, jib or other support gear to create smooth cinematic moving shots. It uses three motors and an IMU (inertial measurement unit) to detect and counteract unwanted movement along three axes: pan, tilt, and roll. 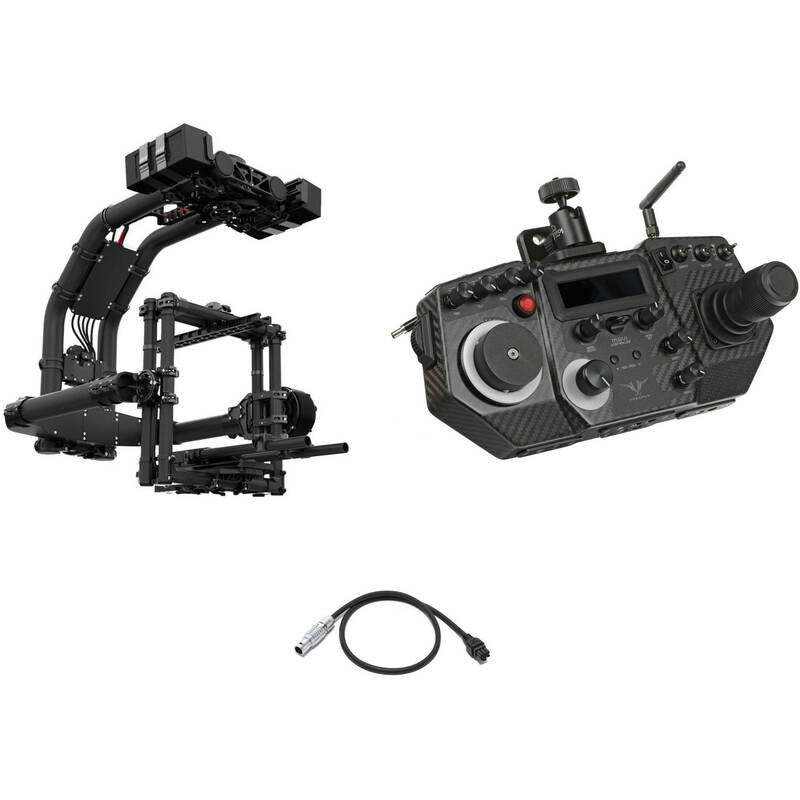 The FREEFLY MōVI XL is suitable for professional cinema cameras and lenses and compatible with both the Mimic and MōVI Controller systems (not included), as well as select Futaba and Spektrum transmitters. As with sled-style stabilizers, the camera should be balanced on the MōVI to ensure best performance. Once balanced, the MōVI pairs over Wi-Fi to an iOS, Android, or Windows app to finalize the configuration process. The MōVI XL is designed to support payloads up to 50 pounds, making it suitable for professional cinema cameras with cinema lenses. The MōVI XL can be operated remotely either with a dedicated controller or by using the Mimic controller (neither controller is included and must be sourced separately). The MōVI XL is compatible as well with most Spektrum and Futaba radios. MōVI XL can be configured wirelessly via Bluetooth LE, from the MōVI XL app on a mobile device. You can hot swap the batteries on the MōVI XL, but extreme care must be taken to avoid damage to the batteries, and to the operator. Majestic Mode: For single-operator use. In this mode the gimbal provides stabilization without counteracting operator-directed camera movements. For example, you could set it in majestic to pan with a vehicle turning on streets or a jib with only one operator for example. This mode is especially useful when the MōVI XL is deployed on a moving vehicle. The Freefly Configurator is a GUI that enables you to precisely adjust your MōVI XL via an iOS or Android device over Wi-Fi pairing. Using separately available mounting hardware, it is possible to mount the MōVI XL on cranes, jibs, ad remote heads. The MōVI XL system uses powerful motors that enable you to create smooth shots while on camera platforms moving at high speed. Want an organic hand-held look? The MōVI provides variable noise filters that allow you to effectively dial in a custom amount of shake to help you achieve the effect you are after. The MoVI Controller from Freefly is a professional grade remote system that allows an MoVI operator full control over pan, tilt, and roll. Compatible with the MoVI M5, M10, and M15 stabilizers, this controller uses telemetry from the MoVI and allows the user to access MoVI configuration menus to enable on-the-fly adjustment of key MoVI parameters. The MoVI controller also simplifies the remote control station by providing power for an LCD monitor and wireless video system. It is powered using a single V-Mount battery (not included), which can also power the controller, monitor, wireless video system, and additional 5 or 12 VDC accessories. An optional Follow Focus Upgrade Kit is available for use with Redrock and Hocus Products Axis1 systems. Note: Please note that firmware version 3.08 is required for the MoVI controller. The FREEFLY MōVI Pro / XL Lens Motor Cable is a lightweight flexible cable designed to handle the rigors of the production day. This 21.65" long cable enables controlling a lens control motor on your MōVI Pro / XL. Box Dimensions (LxWxH) 34.5 x 29.0 x 14.0"
Box Dimensions (LxWxH) 18.05 x 11.65 x 6.35"
Box Dimensions (LxWxH) 3.8 x 3.6 x 0.4"